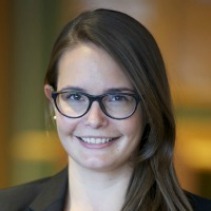 Mona Niebuhr (Alternative Information Center- AIC): Mona, a German national, studied Political Science, International Law and Economics at the University of Munich and Sciences Po Paris. At the time of her AP fellowship, she was pursuing a Master of Science in Foreign Service degree at Georgetown University, with a concentration in International Relations and Security. Mona was also active in student life, serving on the executive board of the Middle East and North Africa Forum, and Conflict and Crisis Forum, at the University. In Washington, Mona also interned for the Center for Preventive Action at the Council on Foreign Relations. After her fellowship she wrote: "Despite all the complications, working for the AIC makes lengthy commuting, waiting at a checkpoint, and skype discussions interrupted by a weak connection worth it since you become part of the AIC family. From the first day, AIC helped me find my footing." The AIC is a joint Palestinian-Israeli organization and has offices in Israel and in Palestine.